Metro Elevate’s Charity of the year! We have great news to share, Metro Blind Sport has been chosen as the charity of the year for the UK’s largest physical activity trade show, Elevate. Recognising an official charity for the first time at this year’s event, Elevate aims to promote disability sport and physical activity to the 10,000+ expected attendees through its partnership with Metro Blind Sport. Elevate takes place at the ExCel in London on the 8th and 9th May. 1000’s of visitors and key decision makers will be attending this year’s event, where there will be over 350 leading fitness-related exhibitors and over 300 speakers delivering a huge range of seminars and workshops. Martin Symcox, CEO of Metro says “We are absolutely thrilled to partner with Elevate and are so thankful for their support. Being their nominated Charity of Year for 2019 provides an incredible platform for Metro Blind Sport to raise awareness of our services, educate people on the sporting opportunities available for blind and partially people, encourage support for campaigns and of course to raise funds for our charity. If you would like to support our work @MetroVISports supplying and promoting all the Blind and partially sighted sport and social events we can! 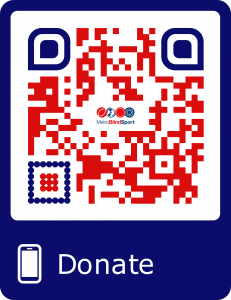 Then please donate link here: https://blindsport.uk/DONATE or feel free to copy and share this QR Code below. As always a huge Thank You to all our volunteers, partners. followers and friends without you, we could not achieve what we do!